Main complex of Teotihuacan. The Nephite capitol after Pahoran moved it circa 17 AD. This application presents our model for correlating North American Archeological evidence with the channeled Book of Mormon narrative. With our model, essentially every culture the texts mentions, ends up being a major culture found by modern archaeologists. In fact essentially all the largest North American prehistoric cultures are represented in our model by the Book of Mormon text. 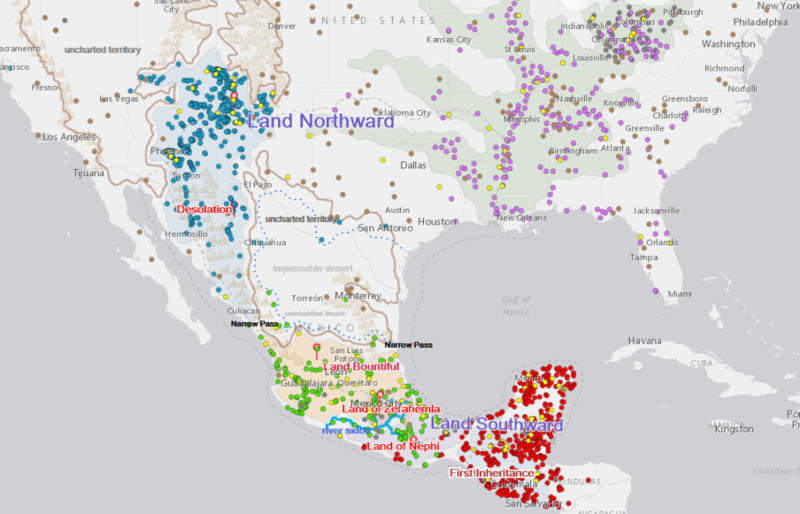 Far from sticking the texts location into a small Mesoamerican or Heartland corner, our model correlates the texts most mentioned cities with the most influential Mesoamerican archaeological ruins. Zerahamla and the Nephites are correlated with what many have called the largest archaeological ruins and most dominate, powerful culture on the continent — Teotihuacan and the Mexican highland culture. The Lamanites are correlated with arguably, the most predominate and populous culture in American prehistory — the Maya. The City of Nephi with it’s towers, priest cult and public works correlates with the great city of Monte Alban. The early Lehites bring true writing to the New World [Zapotec/epi-olmec culture] Nephi brings it to the Zapotec and Laman brings it to the Western Mayalands (called the Land of first Inheritance in the text). The River Sidon matches with what many consider Mexico’s most economically important & strategic water way– the Rio Balsas. The Jaredites end up being not on only the first inhabitants on the continent [Paleoindians to Adena/Olmec], but also the only North American Culture that Archaeologists have found to have coexisted with elephants and other extinct mega-fauna [Clovis/Folsom]. They expanded to covered both Northern America and Mexico instead of just a part of the isthmus of Tehuantepec (Adena, Olmec & all other preclassic groups). The destruction of the post-Christian Nephite culture described in the text, corresponds to the collapse of every major culture on the North American Continent between the carbon dates of 900-1350 AD from Teotihuacahn to Tula, to West Mexico (Chichimecs) to the Anasazi and Cohokia (people’s of the ‘Land Northward). When you get over the hurdle of the narrow neck and exact date correlations, every major event and culture in the Book of Mormon just ends up ‘fitting’ with the continents largest archaeological findings. Problems people may find with our model include suggesting that Book of Mormon dates are based on faulty records, mixed up authors, problems in the channeling process or possibly North American archaeological dates might be systematically skewed. We also suggest the Book of Mormon authors, like nearly ALL ancients, had a poor understanding of continental geography, especially in regards to the Great Salado Basin–believing that the East and West Mexican Sierra Madre Ranges were one and the same–and thus a very Narrow Neck or isthmus existed in Northern Mexico, with a narrow “passage” or travel corridor existing on each coast. A mistake that early European map makers would actually make as well. See the article Excavating the Book of Mormon for references sited. Click on Map Image to open the interactive book of mormon geography map. In our model we believe this failure has been the result of most models being primarily based on two things that ancients were typically VERY bad at. Understanding continental geography and spatial relationships— and keeping accurate calendar systems. Just a cursory look at maps made before the Renaissance age helps one to understand how differently ancient people saw the world. Cultures without pervasive sea-going capabilities simply could not accurately map shorelines. 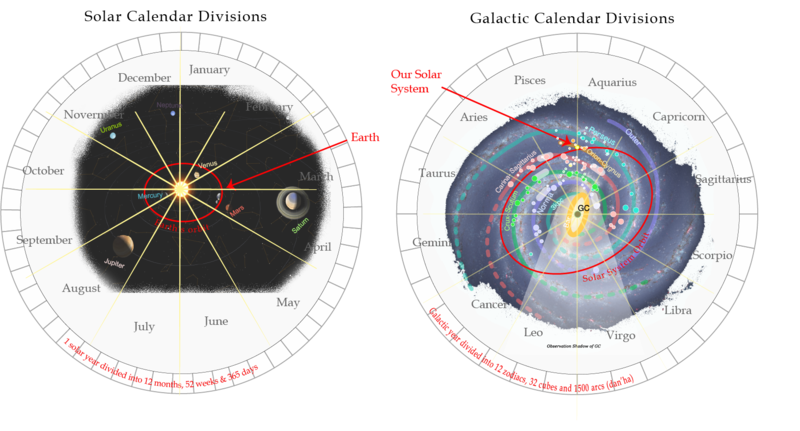 Calendars and succession chronologies also, were typically anchored to partially mythic or faulty events such as a kings assertion to the throne, and often historical texts and genealogies contained large gaps or false interpolations. Modern Mormonism suffers from a desire to make present and past ‘prophets’ into partially infallible intellectuals who possess superhuman understandings of all things they religiously address instead of the truth of the matter, which is that ‘prophets’ like most people often get as much wrong in the things they address as they get right. Our model is different in that it focuses on cultures, events and actual archaeological cities instead of holding Book of Mormon geography and dates sacrosanct. We also consider the Book of Mormon a ‘channeling’ instead of a ‘translation’. Channeling, or the act or practice of a mystic somehow ‘seeing’ events across space and time and/or serving as a medium through which a spirit guide purportedly communicates with living persons was very common during the Second Great awakening, and far better explains the anachronisms and issues which exist in the Book of Mormon text. By looking at the text as a more fluid product of visionary ability instead of a literal translation, amazing correlations become apparent. Book of Mormon events begin to align with all the MAJOR CULTURAL movements & conflicts found in North American prehistory, and a rational view of the Book of Mormon emerges which can be harmonized with the many issues found in the text. Illustration depicting the actual geography of North America versus what the ancient authors of the Book of Mormon may have thought the geography looked like. Shouldn’t it be obvious that the only plausible archaeological correlation for the pre-dearth Jaredites is with the North American PaleoIndians? (C14 dated from between 14,000BC to 7000BC) These were the first inhabitants of North America, and are the only North American cultures to interact with elephants (Mammoth and Mastodon). There are also many other correlations between these cultures but none have seen the similarities because of the difference between carbon dates obtained for these cultures and the dates inferred from the scriptural record. The cultural center for two of the most notable paleoindian peoples (the Clovis & Folsom) are located in the North American Southwest, which as both the Book of Mormon and our model show, matches with the Nephite land of Desolation. Although modern scientific consensus is that these groups migrated from Asia to North America across the bearing straights, we believe that the Book of Mormon account of ship travel is equally plausible (given the 40,000 BC in-habitation of Australia). Diverse groups of ‘Jaredites’ spread out to cover North & South America, and we propose also migrating back into Siberia, Asia and parts of Europe. We also suggest that the Jaredite account, like the Book of Mormon itself, was ‘channeled’ by the ancient author Alma from some ancient record which acted as a talisman or prop. In doing so, the ancient author projected his own biases and beliefs on the Jaredite record in the same way Joseph would have later done with the ‘translation’ (channeling) of the Book of Mormon. 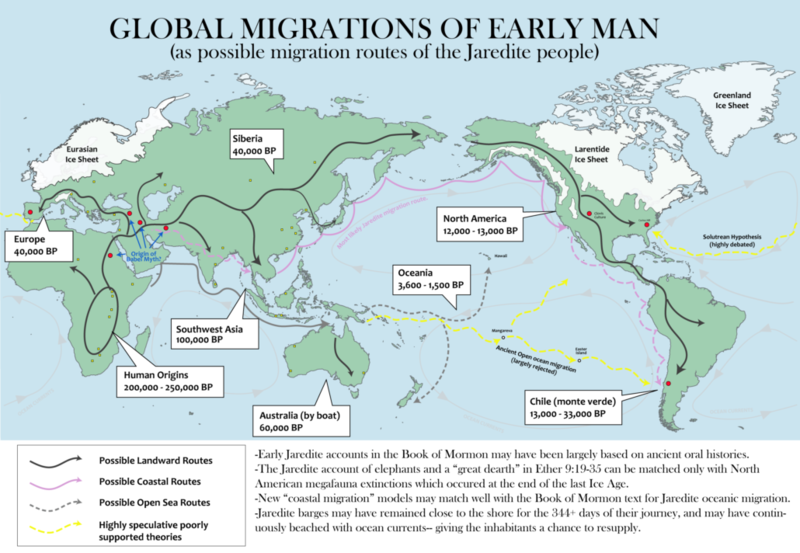 Map of known ancient migrations, overlaid with possible path of Jaredite migration. As the early Book of Mormon ‘pre-dearth’ period in American prehistory was coming to a close, a small group of families left the core area and settled ‘by the seashore’ directly east of the hill Cumorah (Ether 9:1–13). The group of sites, in and around northeastern Massachusetts, are called the Bull Brook Complex by archaeologists. Clovis points found at several of the sites tie it to the Southwest. Building on excavations by D.S. Byers in the mid-50’s, archaeological societies in the Northeast have pieced together the history of the Bull Brook Complex. Their findings and subsequent analysis have shown the interactions of a system of organized, interdependent groups with specialized work force networks . It is recognized as containing the highest level of social structure in America at that time , which would be expected in a ‘refugee camp’ of the royal household . Moroni’s next exposition on culture comes in the days of Lib (Ether 10:18–28), who is based in the Land Northward [Adena culture of the Ohio Valley] but builds a southern outpost at a ‘Narrow Neck’ [Olmec culture of Mexico]. My corresponding period is labeled by archaeologists as the Middle and Late Archaic. Often indistinguishable from one another, these two cultural periods represent a major advancement over the preceding culture. Again the culture spread across North America from coast to coast. There were villages, agriculture, and widespread trade networks. South of the narrow neck, in the Mexican highland and beyond, the only inhabitants we find are organized hunting parties, which ‘coincidentally’ brought spear points of North American manufacture and style. Cahokia Mound, part of the Adena culture. Scientists recognize metallurgy from this time period, and copper is the most common metal found. Many fine textiles have also survived from this period. Moroni says they made ‘all manner of tools to till the earth, both to plow and to sow, to reap and to hoe, and also to thrash’. 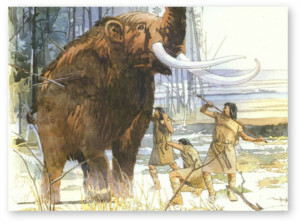 He also says they had, ‘all manner of tools with which they did work their beasts’ (Ether 10:26–27). Most of the tools on this list have been found by archaeologists at sites dating to the Middle and Late Archaic. New weapons were also invented and manufactured, although archaeologists currently view them only as hunting weapons. Another major industry of the Jaredites was wood exploitation. A huge assortment of woodworking tools has been found at Archaic period sites across the Nation. This ‘southern outpost’ built in Mexico, which grew into the Olmec culture, to facilitate trade between the Atlantic and Pacific oceans even captured some trade from Asia. The ‘Jade Masks’ of the Olmec have obvious similarities and cultured ties to Chinese art and Jade work. We believe these ‘Jade Masks’ came from Chinese trade ships and will one day be conclusively tied to Chinese jade mines, and the ‘jade emperor’, through isotope studies. Archaeologists will slowly come to realize that ancient seafaring and trade was more widespread than currently thought. In our article on the scattering of Israel, we detail how the Babylonian empire initiated a global colonial movement, matching closely with the European Colonial era 2000 years later. In our model, colonies started in South America, the Zapotec of San Jose Migote [Nephites], and the Otomangue-speaking people of the Mexican highland [the Mulekites], who brought new and unique pottery & practices to the Americas; in each culture the pottery was already well-developed even at the earliest sites. (These new cultures can often be associated with skewed or eradic carbon dates going as early as 1500-4000 BC) The architecture and burial customs of these groups can easily be tied to the Old World. (although nothing convincing enough has yet to be found to overturn the predominate belief of American/Eurasian no contact.) Square waddle and daub homes with storage pits in the floor dotted their lands. Their temples and public buildings are extremely similar to those of Egypt and Israel. Subfloor burials and burial positions also match those of the Middle East. Many Book of Mormon model’s attempt to match the Olmec with the Jaredites. In my model the correlation is more complex with the Olmec matching only the southernmost branch of the late Jaredite civilization; San Lorenzo corresponding to the ‘great city’ which Ether 10:19–28 says Lib built by the narrow neck. The culture that rose from Lib’s city is seperate from the Jaredite heartland in the Land of Desolation [southwest u.s] as well as Lib’s capitol which was likely in the Adena heartland of the Ohio valley (thus the similariteis between Adena & Olmec mound structures). The ‘narrow neck’ mentioned in Ether is different from the defensive ‘narrow pass’ between Bountiful and Desolation mentioned by Mormon elsewhere in the Book of Mormon. There is no need for any ‘two cumorah’ theory and most of the traditional issues with an Olmec/Jaredite correlation are removed. From as early as the time of Nephi and Jacob, the Nephites of San Jose Mogote [city of Nephi] heavily influence the Olmec. As the Jaredite civilization collapses around 300 BC with the exodus of the elite to join the great Adena war, the new Zapotec/Olmec mix is called Epi-Olmec and is largely defined by the spread of the new Nephite (Zapotec) writing system. Before the Olmec collapse, their influence is seen readily in the early colonies of Izape and Chiapa de Corzo (Lamanite core), San Jose Migote (city of Nephi) and Mexican Highland (Mulekite core). In fact the early mixture of Nephite outliers and Lamenites with the epi-Olmecs sets the stage for the Book of Mormon’s Zoramites, Amalekites, Amulonites and other Nephite dissenters who effectually take control of remnant Olmec cities like Tres Zapotes after the Olmec collapse. The Amulonite priests (Zapotec/epi-Olmec group of Oaxaca) were likley responsible for appointing teachers who began to train the Maya [Lamanites] in the same language and learning of Zapotec [Lemhites] and Mexican highland people [the Nephites]. With this new education the Maya began to prosper and make many technological advances. The sparsely-populated Mayan lands were soon covered with huge temples and city-centers with art and architecture reminiscent of the Zapotec and epi-Olmec style. At the dawn of the formative period there were several major demographic shifts which set the stage for the developing cultures. First, King Mosiah I and his people left the Land of Nephi [San Jose Migote/Monte Alban] and traveled to early Zarahemla [central Mexico, Likely Cholula at that time] to join the Mulekites (S/H: around 200 BC; A/C: around 1400 BC). This is seen archaeologically as an influx of Mixe-zoquean culture brings new advances to central Mexico, and public buildings begin to appear in the larger villages. Archeological evidence in the Valley of Mexico also shows the appearance of epi-Olmec influence in sites such as Tlatilco and Tlapacoya. 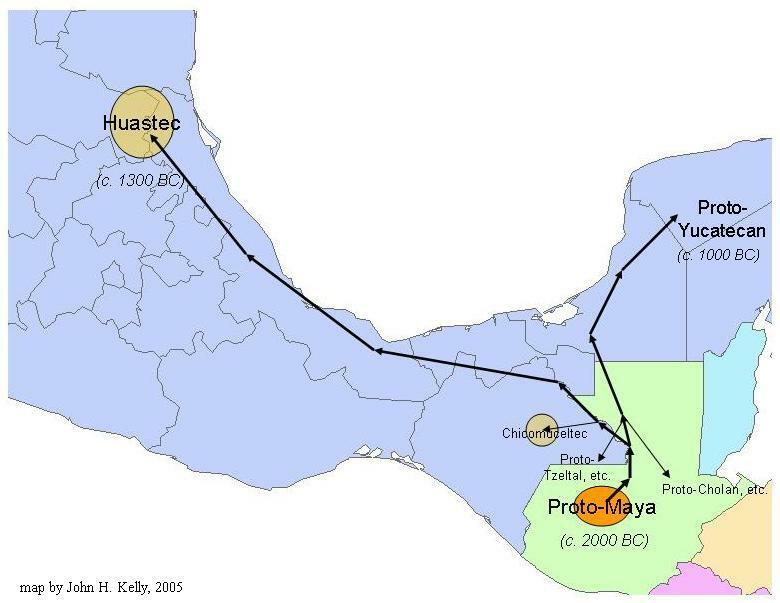 In our research, the early Nephite Zapotecs of Oaxaca effectively merge with the late Olmec [left over Jaredites from Great City of Ether 10:20] and are thus outlier Nephite peoples from before the move to Zarahemla, the late epi-Olmec may also be associated with the Amulonites who enslave the people of Limhi & Alma and build a short lived empire by teaching and exploiting the Lamanites (early Maya). Back in San Jose Mogote [the city of Nephi], the city falls from its preeminence as the ruling elite leave [Moroni I] and those remaining are almost indistinguishable from their epi-Olmec trading partners. Shortly, however, high culture returned to the valley as Zeniff and his people arrive and begin to build anew a fortified city with public buildings and towers overlooking its neighbors [Monte Alban]. The new inhabitants of Monte Alban [people of Zeniff] were an elitist group which maintains strong ties to the Mexican Highland [Zerahemla] for hundreds of years afterward. Initially their culture was very similar to that of central Mexico (from which they had come), but the similarities decreased as time went on and they (the people of Zeniff, now led by King Noah) became extravagant in their prosperity. Lavishness dominates the architecture and material culture of this period. With the influence of Alma the younger, and his companions, and their conversion of Lamoni and his Father (and the expulsion of their loyalists who were likely centered in Mitla), the land eventually becomes a strong trading partner and vassal to Teotihuacan [Zerahemla]. These two great nations, the Nephites on the Mexican Plateau and the Lamanites [Maya] in Southern Mexico, Guatemala and Yucatan, began to experience greater conflicts. Foreseeing the coming challenges, Captain Moroni prepared his people and their lands. First, the weak lands were fortified and the southern frontier was strengthened. Hilltop fortifications began to dot southern Mexico in Veracruz, Oaxaca, and Guerrero. Great urban fortresses were created. No wonder Mormon venerated the leadership, courage and vision of Captain Moroni and the manner in which he prepared his people for war. After Amalickiah’s first attack, a second phase of construction was begun in which fortified cities and hilltop fortresses were built throughout the land of Zarahemla which appears to have stretched from Oaxaca to Jalisco and from southwestern Michoacan to northern Veracruz. Also, the Book of Mormon records Moroni pushing the Lamanites out of the east wilderness and on the west, then building new cities in these areas in order to create a more defensible border. Excavations in southern and western Oaxaca and Guerrero, as well as central Veracruz are now showing such movements of peoples and the construction of new large defensive cities and fortresses. During the time that fortifications were being built in the Mexican highland, a massive weapons production industry commenced throughout Mesoamerica, both in the Mexican Highland [Zarahemla] and in Maya [Lamanite] lands. To accommodate these war preparations, the peoples of the Mexican Highland [Nephites] made major breakthroughs in agriculture and built massive irrigation systems. From that time forward, urbanization and trade specialization, with accompanying prosperity, enveloped the Nephite lands. The great war of Moroni’s time, and the wars that followed, are seen archaeologically in demographic and cultural movements of this time period, and in numerous monuments depicting warriors and captives in both Highland Mexico and Maya lands. The Lamanites displaced and jumbled the Nephites numerous times. There was also a great cultural mixing when groups of Lamanites converted to the Nephite religion and went to live among the Nephites, and also when groups became captives. Cities experienced occasional upheavals, but most of them changed hands without noticeable ruin. Later when the armies of Zoramites prepare to battle the people of Ammon (because they had given refuge to the Zoramites who were expelled), the people of Ammon flee “over into the land of Melek” (Alma 35:13). Our model places the eastern coast cities of Bountiful, Melek, Moroni, Aaron, Nephihah and Jershon on the east Coast of Mexico stretching somewhere between Tampico on the north and Veracruz (or more likely El Tajin) on the south. Many fortified settlements, castles and towers are found within the small stretch of coastline. Among them lies a coincidental correlation between the city of Tamtoc (aka Tamtok) and the people of Ammon. Although Tamtoc reached its zenith in the late classic, archaeological evidence has determined the city was founded as early as 600 BC by Olmec (Jaredite) peoples. If a correlation to the people of Ammon is to be made, better dating of the mostly female remains would need to be found to fit into a window of closer to 100BC to 200AD. The latter date assuming that the early Book of Mormon women of this community started a legacy of feminine predominance which lasted at least a few centuries after its establishment. Perhaps one of the most striking correlations between this city and the Book of Mormon narrative is the linguistic evidence which suggests that the language of the “Huestec” culture which permeated Tamtoc came from the Putin Maya region of Oaxaca and Southern Mexico (our land of First Inheritance). ref. Just before the time of Christ, the combined guerrilla forces of ‘The Gadianton Robbers’ became so numerous as to warrant an unprecedented sociological experiment. All the people of Nephi temporarily abandoned their cities and moved to a new area in ‘The Land of Zarahemla’ (3 Ne 3:13–23). In our model, the urban city built for these immigrants was the great city of Teotihuacan. The old city of Zarahemla (likely Cholula or Cuicuilco) was too exposed and near the forests where Guerrilla fighters could hide, as well as being threatened by volcanic eruptions. So with hundreds of thousands of refugees and immigrants, what was likely the largest pre-planned city in the world was born. In the middle of a large open defensible valley, Teotihuacan was built with the refugee cultures in mind, with defined quarters for each major culture. The Zapotec from the land of Nephi, the Mixtecs from Gideon, and the Totonac and epi-Olmec from the lands of Melek and Jershon, and even Nahua peoples from the land of Desolation and fleeing lamenites from the Mayan lands. The city contains some of the largest structures on earth, with the pyramid of the Sun and Moon rivaling the Great pyramids of Egypt. At its zenith a hundred or so years after the time of Christ there were likely up to 250,000 inhabitants in the 11+ square miles urban area, not counting the many, many satellite communities. The city would soon come to be the de-facto political and religious capitol of MesoAmerica, holding rule and influence of peoples from the Lamanites of Guatemala to Anasazi of Arizona and New Mexico (land of Desolation). In our model, we tentatively suggest a huge supernova (seen as a ‘new star’) caused a gravity wave to reach earth around 34 AD causing slight changes in the earth’s angular momentum (see nutation or ‘chandler wobble’) which was responsible for driving a pulse of increased subduction on the Pacific, Cocos and Nasca Plates at the time of Christ. This minor subduction event initiated an upresidented earthquake, widespread volcanism, orogenic movement and thrusting which may have even eventually uplifted the Mexican cordillera by thousands of feet. If true, this slow isostatically driven uplift could have caused regional climate changes and possibly even the size and extent of water bodies in the Great Salado Desert Basin. (see our article on explaining the narrow neck). Of course it’s also possible that the destruction’s at the time of Christ spoken of in the Book of Mormon were based largely on myth. The many volcanoes which surround the Mexican Highland and border the Central Mexican Volcanic belt could certainly account for many of the phenomena mentioned in the text. However, verses like 4 Nephi 1:9 which states “But there were many cities which had been sunk, and waters came up in the stead thereof; therefore these cities could not be renewed” are hard to explain with simple volcanism. Nor could they share any correlation with the three hours of darkness spoken of in the New Testament in Israel. If one is to believe these difficult to believe parts of the text some cosmological event must be inferred to tie the event together. Or they should just be dismissed as another exaggerated ancient myth. As the ash settled , a new culture spread across the land. In some ways, this new culture was more monolithic; in other ways it was more diverse. Throughout the Americas a new two-room temple replaced varying former styles. A utopia of peace and prosperity is spoken of in legends. There is no evidence of weapons being used at this time, and the murals, figurines, and architecture show designs of nature, lines of symmetry and harmony, and displays of pleasant animals and domestic life. Gone are all signs of a military elite, governmental force, and coercion. The Hopewell, the Anasazi, the Mogollon, Teotihuacan, and the Maya; continent-wide the traits are the same. The great peace resulting ‘because of the love of God which did dwell in the hearts of the people’ (4 Nephi 1:15). The people were united in righteousness, yet at the same time, the culture became more diverse, as the focus turned from making a profit to making quality products and upholding the ideals of family and community. Local artisans replaced the mass-production and expansive trade networks of the preceding period. Thus there was no need to travel extensively ‘on business,’ so people could spend more time with their families. Family gardens replaced mass-produced food. People ate a greater variety of food, but their food was of more local origin. Analysis of skeletons shows that the people were healthier and enjoyed longer life spans than during the preceding period. The arts flowered during this period. The number and variety of musical instruments greatly increased. Pottery and other goods became more useful and more beautiful, and less ornamental and extravagant. A much greater variety of artifacts is found, but in much smaller quantities than before, and with much less waste. The prosperity was great throughout all of the Americas and in all areas of human development, ‘because of their prosperity in Christ’ (4 Nephi 1:23). In the early classic period the church became very wealthy. The people donated their time and skills to the creation and maintenance of beautiful temples and public centers. The population exploded, but at the same time, the cities became less dense as the communities were reorganized and the people spread out across the land. Even the biggest ‘cities’ were only lightly populated, yet they contained ceremonial centers and public buildings large enough to accommodate all the people of the surrounding villages. Social classes disappeared, yet the standard of living increased everywhere; And ‘they were in one, the children of Christ, and heirs to the kingdom of God’ (4 Nephi 1:17). The peace was not to stay. Midway through the Classic social classes appeared again. An extravagant upper class emerged; churches began to decorate their temples with riches; idol worship commenced; mass production and long distance trade networks appeared. Gambling, tattoos, body-piercing, and drugs became vogue, enveloping society. The gods and culture of the Pre-Classic Maya returned in places and Teotihuacan responded by exercising harsh dominion. Wars spread across the land. Soon two distinct super-powers emerged: the Quetzalcoatl Cult centered at Teotihuacan and the Jaguar Cult of southern Yucatan. Mayan frescos paint the conflicts. In Maya lands they portray early local victories. As the Jaguar Cult grew in numbers and power they began conquering Central Mexico: at Xochicalco archaeologists have found a mural depicting the Eagle Warriors of the Jaguar Cult crushing the feathered serpent, Quetzalcoatl. It dates to just before Teotihuacan was abandoned. War moved in succession from Teotihuacan to the Chichimec lands, to the coast of West Mexico, then north across a ‘narrow ecological strip’ in the Sierra Madre Occidental to the Southwest. The amazing burst of economic activity in the Anasazi lands followed, corresponding with the build-up of the Toltec Kingdom and the evacuation of the upper class in Maya lands. Then came the great slaughter. Starting in the south and moving north the entire Southwest was desolated. Smaller sites were abandoned and great defensive cities were built but to no avail. Archaeologists find site after site burnt, abandoned, or covered with unburied bodies. The destruction is staggering. It moved to a line of sites from Mesa Verde, Colorado to Albuquerque, New Mexico but then these too were abandoned. Then the entire Midwest was abandoned and the Mississippian culture collapsed. Archaeologists are at a loss to explain why these culture’s collapsed. Drought is a common (but poor) explanation, but evidence of war is present although often ignored or explained away. We believe the social fabric of these cultures was destroyed as the Lamanite armies chased the Nephites from the Valley of Mexico, to the American Southwest, and finally up the Ohio arm of the Mississippi (the main travel corridor) to its end in the Land of Cumorah in Western New York.